(JTA) — Some 160 rabbis, including several prominent American Orthodox leaders, appear on a list of rabbis whom Israel’s haredi Orthodox-dominated Chief Rabbinate does not trust to confirm the Jewish identities of immigrants. Rabbis from 24 countries, including the United States and Canada, are on the list. In addition to Reform and Conservative rabbis, the list includes Orthodox leaders like Avi Weiss, the liberal Orthodox rabbi from the Riverdale section of New York, and Yehoshua Fass, the executive director of Nefesh B’Nefesh, a group that encourages and facilitates American immigration to Israel. The Chief Rabbinate controls all Jewish marriage in Israel, and immigrants who wish to wed there must first prove they are Jewish according to Orthodox law — whether they were born Jewish or converted. This proof often comes via a letter from a community rabbi attesting to the immigrant’s Jewish identity. One midlevel bureaucrat at the rabbinate, Rabbi Itamar Tubul, handles every claim. 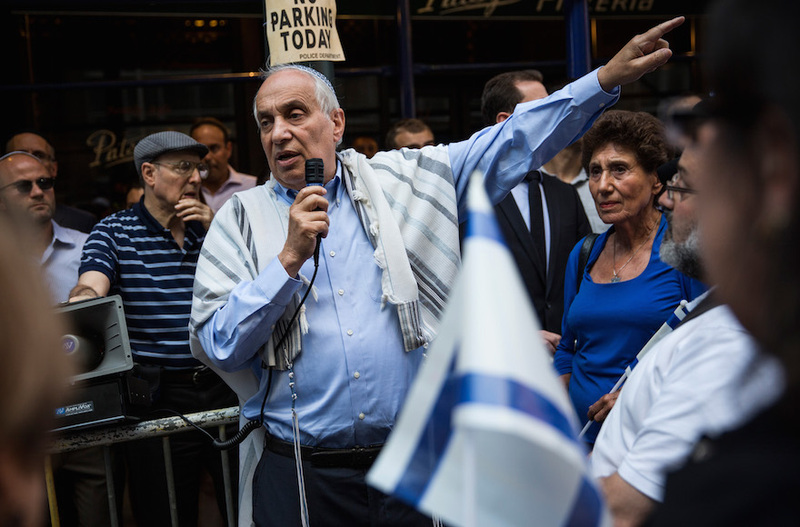 The publication of the list comes on the heels of a clash between American Jewish leaders and the Chief Rabbinate over how to determine Jewish identity. In June, Israel’s Cabinet advanced a bill that would give the Chief Rabbinate authority over all official Jewish conversions within Israel. Following an outcry from Jewish leaders in America, the bill was shelved for six months. The Chief Rabbinate’s antipathy to Reform and Conservative rabbis is well documented. Its distrust of some Orthodox rabbis abroad was seen last year when the rabbinate omitted several prominent Orthodox figures from a list of rabbis it trusts to confirm the authenticity of Jewish conversions. The rabbinate’s latest list comprises rabbis whose letters it rejected during 2016. In addition to Weiss and Fass, the list includes Joshua Blass, a New York congregational rabbi and student adviser at the modern Orthodox Yeshiva University’s rabbinical seminary; Joseph Potasnik, executive director of the New York Board of Rabbis; Adam Scheier, a past president of the Montreal Board of Rabbis, and Daniel Kraus, director of education at Kehilath Jeshurun, a tony modern Orthodox synagogue on Manhattan’s Upper East Side. The rabbinate sent the list to Itim, a nonprofit that guides Israelis through the country’s religious bureaucracy, and was obtained Thursday by JTA. In 2015, Itim filed a freedom-of-information request in a Jerusalem municipal court demanding a list of approved foreign rabbis, and received this list as part of that case. The Chief Rabbinate’s spokesman, Kobi Alter, said in a phone interview Thursday that “there is no list of unrecognized rabbis” and did not respond to a follow-up inquiry via email. Last year, the rabbinate promised to release criteria regarding which rabbis can be approved. Alter told JTA that the criteria are still being composed. Israel’s Ashkenazi chief rabbi, David Lau, said he didn’t know about the list before it was sent out. In a public letter Sunday, Lau called the list damaging and sounded incredulous that it was composed without his approval. “The Chief Rabbi was shocked to discover this list. This was done without the rabbi’s knowledge or his agreement. How can a list like this be publicized without the rabbi being made aware of the list itself or of its publication?” read the letter written by an aide on behalf of Lau and issued Sunday. According to a JTA tally of the 66 U.S. rabbis on the list, at least one-fifth are Orthodox, including one alumnus of the Baltimore haredi Orthodox seminary Ner Yisroel. The vast majority of U.S. rabbis on the list are Reform or Conservative. Weiss’ inclusion is the latest blow he has absorbed from the right wing of Orthodox Judaism, whose leaders have objected to his efforts to expand women’s participation in Orthodoxy. In 2013, the rabbinate rejected a proof-of-Judaism letter from Weiss, then reversed course and accepted it following complaints from American Jewish leaders. Last year, the rabbinate rejected a similar letter from Rabbi Haskel Lookstein, Kehilath Jeshurun’s former rabbi and the rabbi who oversaw the conversion of Ivanka Trump. It also rejected conversions overseen by Rabbi Gedalia Dov Schwartz, the chief presiding judge of the National Beth Din of the Rabbinical Council of America, the main modern Orthodox rabbinical court in the United States. In some cases, Tubul made the rejection. But in Lookstein’s case, a district rabbinical court in the central Israeli city of Petach Tikvah rejected his imprimatur when a woman who converted under his auspices applied for a marriage license there and was denied. These rejections have caused consternation among American Orthodox leaders who are invested in maintaining a good relationship with the Chief Rabbinate. But following Weiss’ initial rejection in 2013, former rabbinate spokesman Ziv Maor told JTA that examining the credentials of Orthodox rabbis is crucial to the integrity of the evaluation process. Rabbi Baruch Goodman, who runs the Chabad-Lubavitch center at Rutgers University in New Jersey, said he was surprised to find out he was on the list. Goodman, who declined to be quoted, told JTA he has been writing proof-of-Judaism letters for nearly two decades without incident. Scheier, the Montreal rabbi, said he was unfazed by his inclusion. He said he is working with Itim to encourage transparency and consistency in the evaluation of rabbis.